If you are using Design mode to edit ADF Faces screens in JDeveloper 11g IDE - keep in mind that Design mode is not functioning properly in the latest JDev 11g R2 (11.1.2.2.0). It breaks when you try to display ADF Faces screen in Design mode - renders blank white. It happens randomly, but quite often. If you are not using Design mode - no problem, but I know some developers who prefer to work in Design mode while editing ADF Faces screens. If so - you should stay on JDev 11g R2 (11.1.2.1.0) or wait for the next version. But there are good news also. Wrong bean scope assignment bug is fixed in JDev 11g R2 (11.1.2.2.0). 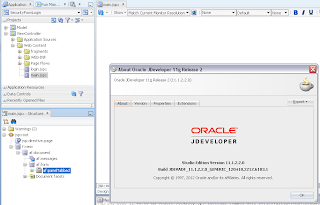 Read more about it - JDeveloper 11g R2 Bug - Wrong Scope for Managed Bean. WARNING: The framebusting context param 'oracle.adf.view.rich.security.FRAME_BUSTING' has been deprecated. Please change your web.xml to use 'org.apache.myfaces.trinidad.security.FRAME_BUSTING' instead. The legal values are 'always', 'never', and 'differentOrigin'. If you were setting the value of 'oracle.adf.view.rich.security.FRAME_BUSTING' to 'differentDomain', then please note that you should set 'org.apache.myfaces.trinidad.security.FRAME_BUSTING' to 'differentOrigin'. I get this when I've set the viewcontroller project to enable user customizations->Across sessions using MDS. As so as I switch it back my template and pages show again. I've read comments that it appears to be linked to whether it's a new application generated under or 11.1.2.2 (Which appear to be ok) or an upgraded application which suffers the problem. Either way it's pretty crap quality control from the responsible team in Oracle. 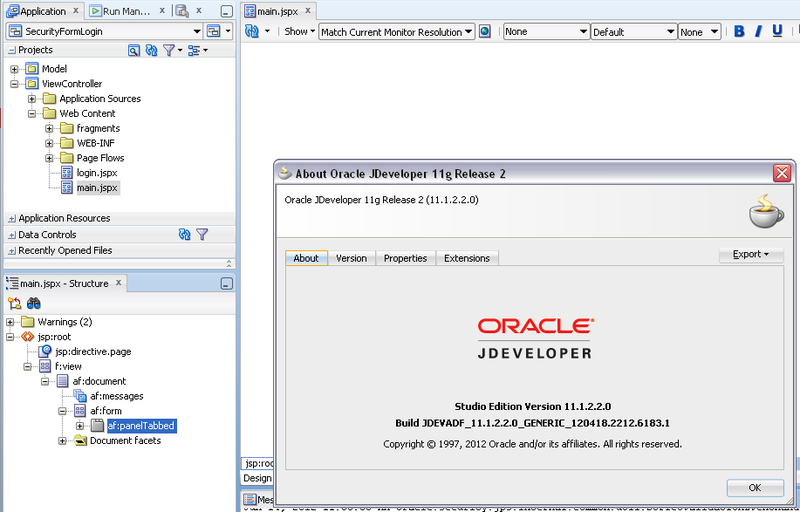 Is this issue resolved in the version 11.1.2.3.0 of JDeveloper ?. I have imported the Oracle Rich client demo app, initially the design tab used to show the templates design and page design just like the actula page. Now suddenly the layouts inside it looks like nested rectangular boxes with +/- collapse links. Do you know how to resolve this ? Try to restart JDev, this behavior may happen in any version.